"His solos ring with an almost religious fervor"
"A prodigy . 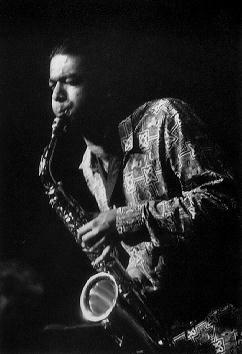 . . a saxophone phenom"
"One of 24 young New York jazz musicians to watch in the year 2000." "Mahanthappa is one of the freshest, strongest young voices on the alto saxophone that I've heard in a long time. With his experience of the rich tradition of Indian music and jazz, his music is full of rhythmic surprises and swing. He's got something to say and the future is his! Check him out!!" "How delighted I was to hear Rudresh Mahanthappa play the alto saxophone. His sound is rich and mature and those ideas!!! . . . twisting, turning, colorful lines with lots of suspense. He is a true improviser with blistering technique. Watch out for Rudresh!!" "It's very refreshing and encouraging to hear music of this intensity coming from a young saxophonist. Rudresh exhibits a rare harmonic and melodic fluency which projects his ideas beyond mere craft, to a well developed form of art." "This is some very exciting and adventurous music by a promising young alto saxophonist. Rudresh Mahanthappa is ready to be heard." Rudresh Mahanthappa represents a new generation of American jazz musicians by portraying the culture of his ancestry through his music. Jazz is an indigenous American art form; yet Rudresh, having been raised as a first-generation Indian-American by immigrant parents, has fused his various cultural influences to creatre a truly unique style. At the young age of 29, he has already made appearances Steve Coleman, Jack DeJohnette, Harry "Sweets" Edison, Von Freeman, George Garzone, Tim Hagans, Fareed Haque, Vijay Iyer, Howard Levy, David Liebman, Joe Lovano, Greg Osby, Dr. Lonnie Smith, and Clark Terry. Rudresh has also participated in several international jazz festivals including India's Jazz Yatra, the Chicago Jazz Festival, the Jamaica Jazz Festival, the Toledo Jazz Festival, Jazz in the Sangres, the Verona Jazz Festival, and the Flint Jazz Festival. Mahanthappa has his Bacelors of Music Degree in jazz performance from Berklee College of Music and his Masters of Music degree in jazz composition from Chicago's DePaul University. Rudresh Mahanthappa currently lives in New York where he is clearly emerging as an important and influential voice in the jazz world. Click here to learn more about Rudresh.